In 2012 Jamie and Langley will be running 12 marathons in 10 months for the Tiny Lives charity. What follows below is a little insight into what we are trying to complete. 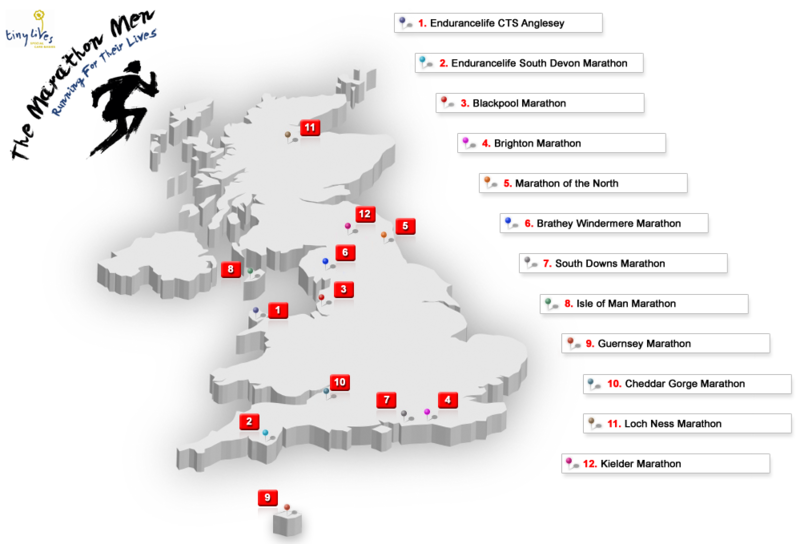 2 Men, 12 Marathons, 10 Months … This is the list of marathons we are currently planning to enter as part of our challenge in 2012. We have places secured for most of the races, however a few of the marathons have yet to open for entrants. Check out the details of each of the marathons further down this page. 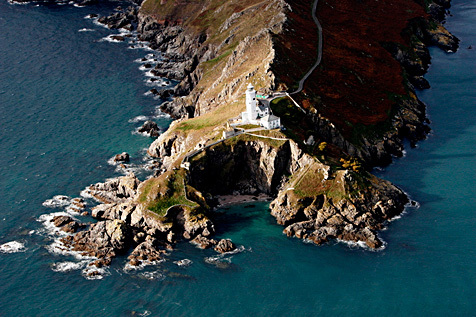 The Isle of Anglesey (Ynys Mon) is situated off the north-west coast of Wales near the beautiful Snowdonia mountain range. It is separated from the mainland by the Menai Strait. Anglesey has a dedicated coastal path running around the whole island. The cliffs have been shaped by the bracing Irish Sea and it’s the ideal setting for the start to our 12 marathons in 10 months challenge. This marathon is actually the fourth stage in the Endurancelife CTS trail series; they describe the terrain as grass, rocks and mud. Jamie and I will certainly have to have our wits about us! More worryingly the difficulty level is 3 – Strenuous, although to be honest every marathon I’ve taken part in has been strenuous! To add to our enjoyment the course is actually slightly longer than a standard marathon at 27.59 miles with an ascent of 2,264 feet over the distance. Nothing like starting with an easy one; and this is nothing like starting with an easy one! If I don’t feel forty yet I will do by the time we hit March. The South Devon stage of the Coastal Trail Series (Stage 5 this year) has become a cult classic. The course is contained within an Area of Outstanding Natural Beauty and is simultaneously picturesque and punishing. With its blend of jagged rocks interspersed with idyllic sandy coves, this coastline is jaw droppingly beautiful and hugely inspiring. The event is extremely popular, and you can see why from the video below as the course weaves in and around the technical coastline, before heading inland to tackle a few of the infamous Devon hills! Now in my previous post on the Anglesey Marathon I noted that it was a very difficult start to our challenge. However when I’ve come to look at the stats it is this marathon that stands clear of all the others in terms of technical difficulty and shear terror. I guess you know you’re in for a treat when the organisers specify that the following items are mandatory to wear or carry for all those participating in the Marathon. 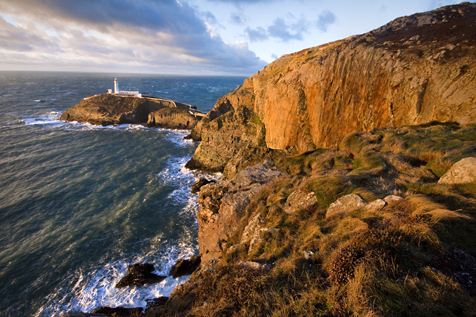 As part of the same Trial series as the Anglesey marathon the organisors rate this particular run as difficulty level is 4 – Severe, a step up from Anglesey! To add to our enjoyment the course is actually slightly longer than a standard marathon and Anglesey for that matter at 28.1 miles with an ascent of 4,375 feet over the distance. If there is a marathon that we fear next year it is this one! On the upside it really does look truly stunning and for your enjoyment I’ve linked the video of this years race below. 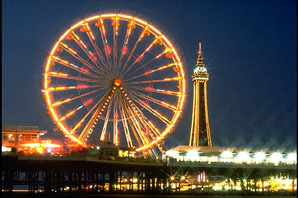 Blackpool is a coastal resort town in the north west of England. It is the most popular resort in the country with approximately ten million visitors annually. Well in April that figure will grow by another few thousand as we and many others descend upon the town to take part in the 2012 marathon. At last this one looks like a traditional marathon with plenty of black stuff beneath our feet from the first to the last of the 26.2 miles. I’m sure Jamie and I will consider one of the places in the calendar that we may get a PB (we haven’t quite decided what that would be, I’m guessing somewhere under 4 hours!) with an ascent of only 344 feet over the distance. A collective hoorah from Jamie and I … I hope you don’t mind! 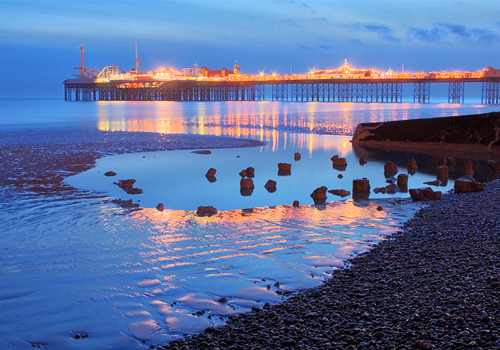 The Brighton Marathon takes place each April in Brighton on the south coast of England. The inaugural Brighton Marathon was organised by former international athlete Tim Hutchings and former Brighton club athlete, Tom Naylor. The first running of the race took place on 18th April 2010, a mere two years ago! The race opened to 12,000 entries, with 7,589 participating on race day. The course start line was at Preston Park. 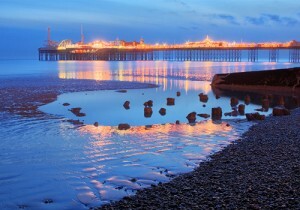 The route took in some of the sights of central Brighton before heading East towards Rottingdean. The race then headed west out to and around Hove, before returning on the seafront and finishing on Madeira Drive, close to Brighton Pier. In its second year (April 2011), over 8,000 runners took part with spectator numbers estimated at around 120,000. The race has acquired the status of “Britain’s No. 2 marathon” for its profile in the national running arena, for its standard of race organisation and for the publicity generated by the event. More than two hundred charities had runners in the 2011 event and this demand has led to an increase from 3,000 to 5,000 in the number of places being offered to charities in 2012. The 2012 event has seen a 20% increase on entries to an acceptance of 18,000, putting it in the top 12 running events in the UK. This is another race similar to Blackpool where Jamie and I will feel we can get a PB (we still haven’t quite decided what that would be, I’m guessing somewhere under 4 hours!) with it being a pretty flat course. The inaugural MARATHON OF THE NORTH will take place on May 6th 2012 and Jamie and I will be there! The Marathon of the North course starts and finishes at the Stadium of Light (Booo!) on the North bank of the river Wear. 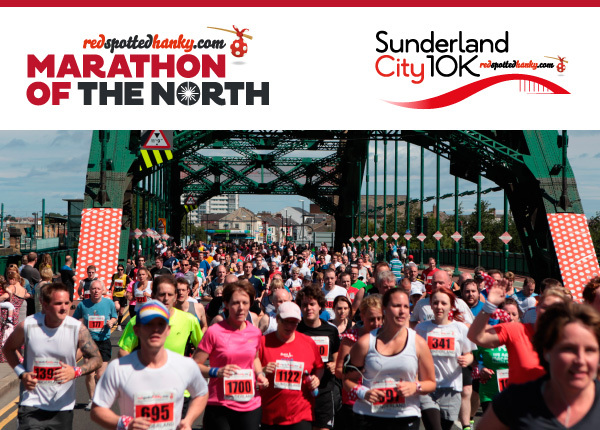 After crossing the bridge, the marathon route follows the first few km’s of the Sunderland City 10K course. The first half of the race is run entirely on the south side of the river visiting many of the city’s suburbs and travelling down wide easy running streets. It is predominantly flat with few noticeable gradients. A circuit of the picturesque Barnes Park is the pre-cursor to the halfway point before heading back across the Monkwearmouth Bridge and a quick wave to the crowds at the Stadium of Light as you head out for the last 10 miles which is run predominantly with the river and the stunning beaches and coastline as your companion. The original Windermere Marathon first took place in 1982 and ran between 1982-86 before being revived by Brathay Trust in 2007. In 1982 a group of local runners and volunteers got together to form a Windermere Marathon committee and organised the first marathon around England’s largest lake. This group of enthusiasts included: Alan Dodds from Windermere Rotary Club, John Nettleton from Kendal AC, and Pete Bland, Chairman of Kendal AC. Pete’s wife Anne Bland subsequently won the Ladies race twice in 1984 and ’86. They were joined by Chris Brasher – who of course started the London Marathon, and John Disley. 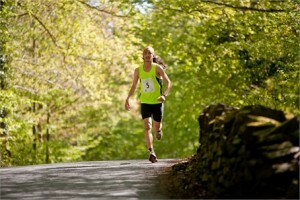 The inaugural Windermere Marathon in 1982 attracted 2,600 entries, at an entrance fee of £2.00! The course record of 2:23:16 was set by Mike Critchley of Bolton AC in 1985, so Jamie and I stand a good chance of getting a record at this one!!! ;0). Along side the standard marathon are a group of loonies who take part in the Brathey 10 in 10, essentially they run the marathon ten times over on ten consecutive days!! Mad! 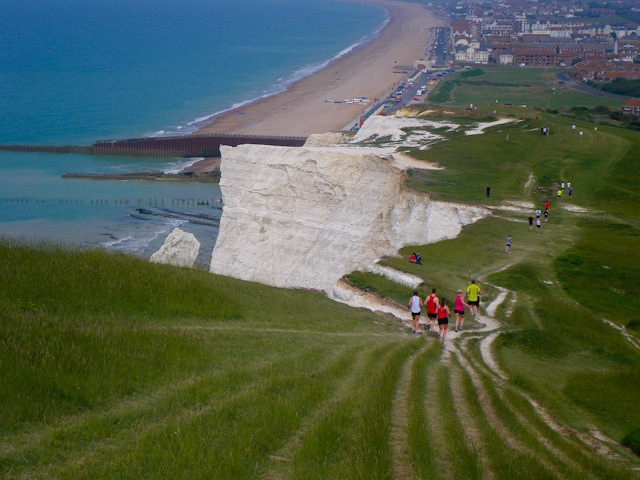 In just a few short years the South Downs Marathon and marathon relay have become classics on the Trail Running calander – which is not surprising when you look at the fantastic scenery on the route. For 2012 they’ve also announced that there will be a half marathon as well. Starting at Slindon College we will be set off using a wave system starting 20mins apart with the first wave consisting of relay runners, the second runners who predict a finishing time of over 5hrs (that will be me then! ), then the marathon runners predicting times of between 4 and 5hrs and final wave for runners predicting under 4 hrs (nice one Jamie!). With an elevation gain of nearly 6000ft this looks to be one of the very hardest marathons that we’ll be taking part in this year. Jamie and I can hardly wait to tackle those hills! oh the hills, those beautiful hills … oh god hills! 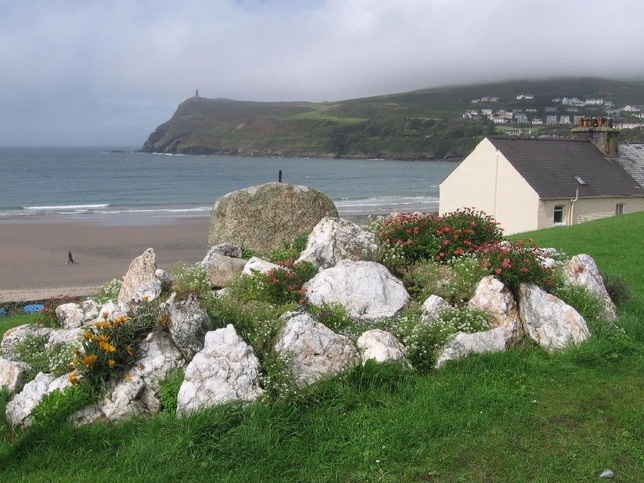 The Isle of Man Marathon race is run over the Manx Northern course, starting and finishing in Ramsey. The Isle of Man is somewhere neither Jamie or I have visited to date so we’re both looking forward to this one. 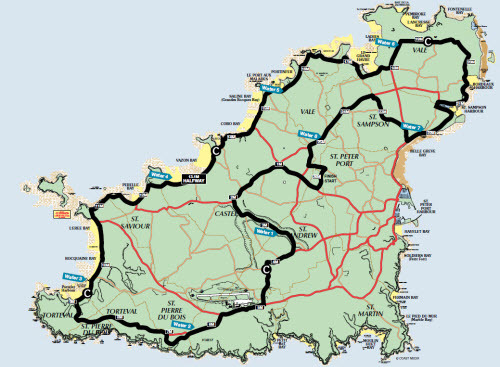 Unfortunately we can’t stay long enough to take in the TT races whilst we’re there but i’m sure we’ll have fun nevertheless! Guernsey is the second largest of the Channel Islands, nestling in the bay of St. Malo and only 30 miles from France and 70 miles from the south coast of England. Guernsey is not only renowned for its laid back atmosphere and balmy summer days, it is now known internationally for its marathon. 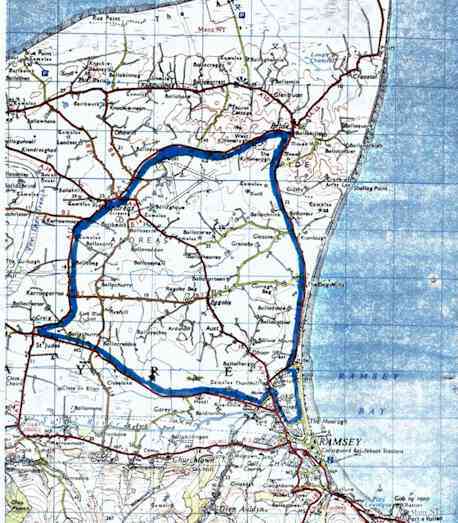 The course, which has been officially accredited by UK Athletics, to be exactly 26 miles and 385 yards, will take Jamie and I through 9 out of the10 parishes, passed fishermen’s cottages and sandy beaches, along flower lined roads and lanes, and through valleys shaded by panoplies of lofty beeches, sounds great :o.